When we left off it was time to layer the Topper on top of the backing and batting and quilt it. 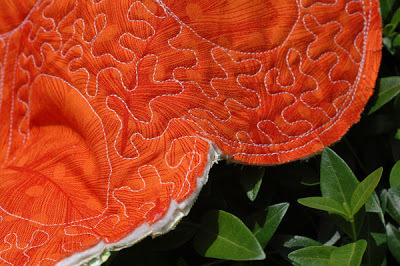 Just for a second, I’m going to skip ahead and show you some photos of the finished piece so that you can see the details of the quilting. I’m not the best quilter but I am working on my skills and the Bernina Stitch Regulator helps a lot! You’ll notice that I big arcs radianting from the center of the topper behidn the bunny and then filled in the arcs with concentric teardrop shapes. This helps hide the seams where the Dresdens met and helped focus your eye on the center section as whole. I also marked off arc areas around the eggs and filled them with stippling. With all that motion I quilted some straight lines between these areas for contrast. Okay, back to assembly… Once you have your Easter Table Topper quilted, you are going to apply facing. Take a large (at least 29”) square of fabric that is bigger than the size of your Topper and fold it in half both way, pressing lightly, to find the center. This will be your facing. Using that center mark, draw a big circle (mine was about 12-1/2”) in the center of the fabric square. Staystitch on the circle line. Cut out the center of the circle, using a 1/4” seam allowance. Clip the seam allowance right up to the stitching line at 1/4” intervals. Press the seam back along the line. Use steam! The better your pressing line, the easier it will be to finish. Layer the facing on top of the Easter Table Topper right sides together, centering the design inside the cut out area. Pin. ﻿Turn the entire unit over and sew all the way around the piece, through all layers, using a 1/4” seam allowance and your walking foot. Trim off extra facing fabric. Clip the 1/4” seam allowance every 1/4”, right up to – but not through – the seamline. Clip through all layers – including the batting! You might have to clip a little extra at the internal corners where the scallops meet. I’m clearly am not a free motion expert – note the overlapping stitching in the above photo, but you would be hard pressed to see that on the front side of the project. 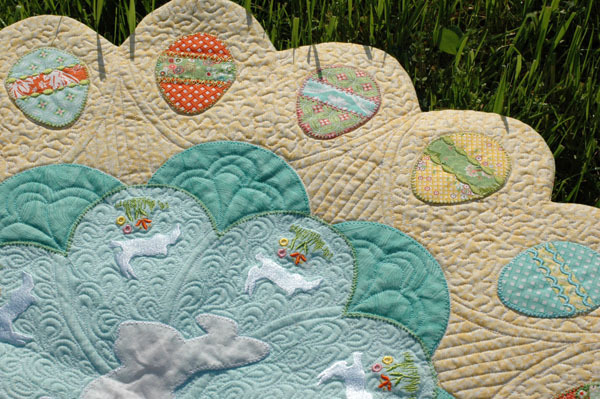 Small projects are the perfect oppotunities to practice quilting – it doesn’t have to be perfect! Slipstitch the facing to the back of the Table Topper, all the way around your circle. While doing so feel free to insert a label, if desired. That’s it. Hope everyone has a happy Easter! That is beautifully quilted! Thanks for the pattern. Amanda ~ This is absolutely GORGEOUS! And you did an amazing job with the quilting. Stop that apologizing for crossing over a line. I know that rule all too well from my cake decorating days while creating cornelli lace but not too many are going to sit and look for that but yea, I know, I also apologized when I did that cross over a line thing myself. 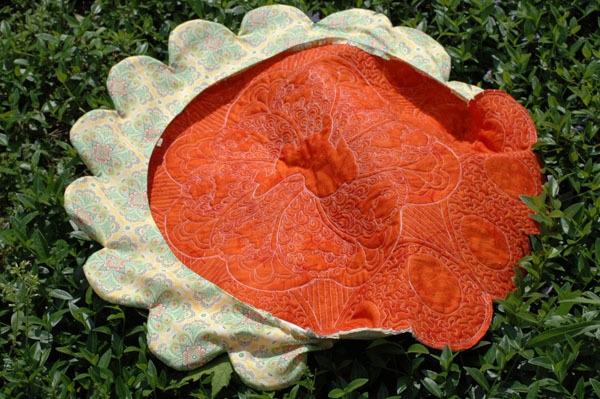 You have created a beautiful table topper that anyone would be envious of having. Just beautiful. And thank you so much for all the time you spent writing all the instruction for us to also make one for ouselves. This is so very beautiful! Well done! Oh that is adorable! Your quilting is marvelous! Amanda!! One of the prettiest things I have seen in a long time, just beautiful. 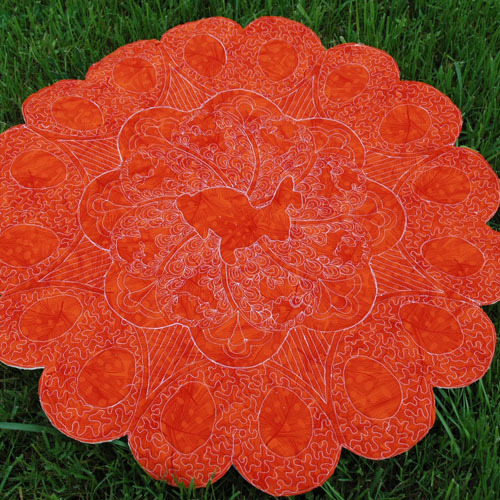 This table topper is just beautiful! Speechless!!! Over the top cute!!!! wow! that is a blue ribbon quilt. I love that. the back even looks awesome. well done! Love the colors and all the beautiful detail! An amazing project, perfect for Easter, reminiscent of an Easter egg plate. Thanks so much for sharing. Amanda, I 'd love to get an ART version of the adorable bunny embroidery design. My email is marylouc@mac.com. Thanks so much, and happy Easter! I Love It! If you are sharing, I loved to have it. I use ART version as well. Love the table topper! Would love the design also. I would need a JEF format. Send to dhutch3 @ verizon.net. Thank you so much for your creativity and willingness to share. Martha, please leave me your email and the file type you need. My great granddaughter would love one of these quilts. 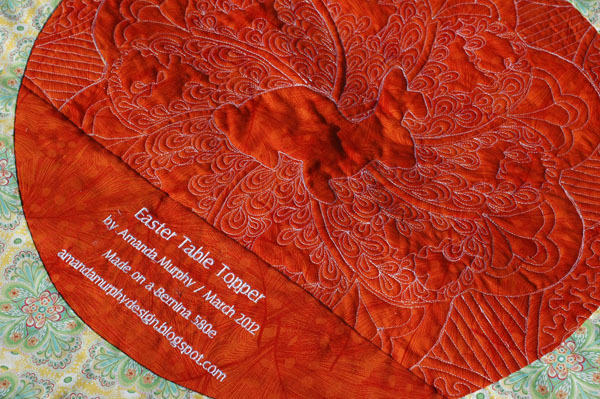 Amanda: Your Eeaster table topper is delightful and clever. One that I will definitely make as it will make a great centerpiece on the dining table or sideboard and grace both an Easter Basket or a lovely flower pot filled with spring flowers. Please send me the .ART format. Hi Amanda! Gorgeous design. Please send in VP3, VIP or Hus, DST, in that order of preference, as available. Thank you. This is so cute! I use PES or DST format. Thanks. Just returned today from Cincinnati Quilt Festival where I saw this done. Beautiful! Drove the five hours home and got right online! Please send file in .ART format. Thanks for the inspiration! the table topper is adorable! 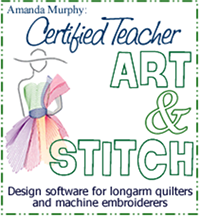 I would like to have the embroidery design in ART format. I LOVE this table topper!!!! I'll give it a try next year if you will send the files–VP3 or PES preferred, but I can convert. Thanks so much. Alice at sherfyr@aol.com. I really love your table topper and I'd like to get the bunny embroidery. My address is: thecarrs156@msn.com Thank you. This is beautiful. Wish I had found before Easter – but now I have lots of time to finish for next year. Would you please send me the bunny embordiary in .ART format. My email address is vistajrc@nventure.com. Thanks! 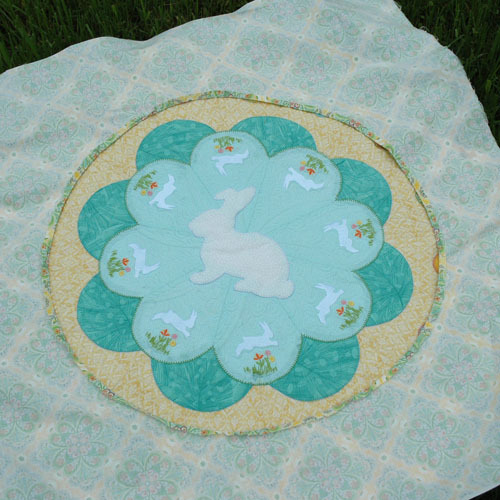 Loved the cute bunny table topper, and I want to make it. Would you please send the embroidery design in ART format. 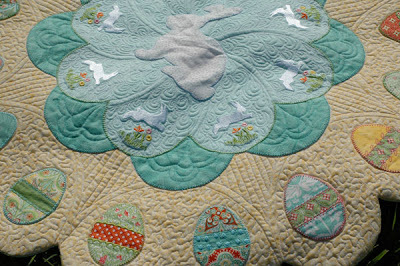 I just saw your beautiful Easter Topper via the Bernina website. It's simply incredible & so inspiring! I've always longed for a reason to use the decorative stitches & your topper is perfect! Please send your bunny embroidery in the PES format to me at 7andersont@gmail.com. Thanks so much!! This is a lovely project. The embroidery and quilting realy dresses up the dresdens. 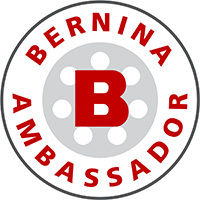 I would love the files and have a Bernina 830 and version 5 software. This is very beautiful. I would like to try and make one for my next Easter dinner table. I hope mine turns out as well. Your quilting is beautiful. Just found this table topper and it is adorable. Have the directions but need the files. I can use ART or EXP. My email is mspattck@att.net. Thanks and keep them coming now that I found you. Your project is exquisite and your tutorial is excellant. As a teacher, I appreciate good instructions. Wonderful site! Hi Just found your great Easter project and wanted to ask if you could send me the design in the PES form. I would love to get a jump on this project for next year. Love your topper could I please have the design. You are so nice to share your work. Wonderful site. Your table topper is beautiful ! Please email the information to me in the PES file format. Thank you. Please leave your email address as your profile isn't public so I can't send you the file. Thanks! Thank you for this wonderful tute !! Hopefully I can get a jump on this table topper for next easter. Amanda this Easter Table Topper is so beautiful. I was browsing the internet and came across it. I fell in love with it. Could you please send me the instructions. I thank you and keep up the beautiful work. You table topper is awesome! I would love to make it for my grand-girls. I need the design in Art format. 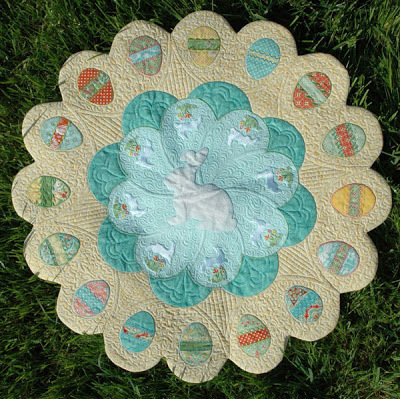 I found your Easter table topper via pinterest and think it is so beautiful; you are a very talented lady! Thank you so much for giving this lovely pattern for free. Could you send me the file to my email addie. Thanks. I put your blog in my faves so I can visit again. 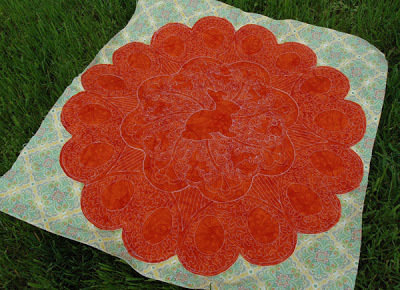 I love your darling table topper and I am gathering all of the fabrics to make mine. I would love to have your little bunny design to compliment my topper. I am also planning to make a topper for my daughter and daughter-in-law for their Easter tables next year. My Bernina workhorse is an Artista 185e. I LOVE the Easter Table Topper! I would love the file. My email is rhondahawkins57@gmail.com. I pinned this table topper some time ago, and now that Christmas is over, I want to start working on it. Is it too late (2 years later, yikes!) to request the embroidery design? If I'm too late, I'll muddle through with something and leave you with a huge Thank You for such lovely fabrics and designs! If I'm not too late, I have a pfaff, so prefer .vp3, .hus, or .pcs but my software can make do with any format except .art. I just saw this design. It is gorgeous. My son just got married this year and his wife would love decorations for the house. If you are still sending the design, I use pes files, but also have software that can change any design. I love your Easter Table Runner and would love the design for it if you are still sending them. I also would like the big bunny that goes in the center as I did not see any where to down load it. If possible could you send me the whole file as my computer and printer do not want tp play nice and I am having trouble getting all the directions and templater. This Easter table topper is beautiful. I would love the design, if you are still sending them out. Though Easter has come and gone, I might be able to get it done for next year. Is the large bunny part of the file too?